Thermo-hygrometers, also known as relative humidity (RH) meters, are incredibly useful tools for a variety of applications. From concrete installations, to home inspections, to checking RH conditions in a lumber storage yard, a thermo-hygrometer can be invaluable. However, like with many advanced tools, proper thermo-hygrometer care is critical for ensuring accurate and reliable results. Thermo-hygrometer accuracy can be affected by a number of factors, such as the condition of the sensor element, the hygrometer’s internal components, and even whether or not the battery is sufficiently charged. One of the most common mistakes that even professionals make in their thermo-hygrometer care is that they leave the device out for days on end. This is often done for the sake of convenience—just leaving the RH meter mounted in place so they can make a quick relative humidity check with minimal setup. Unfortunately, this leaves the sensor element exposed to numerous contaminants in the air. Over time, these contaminants will damage the sensor element, causing sensor drift—meaning that thermo-hygrometer accuracy will suffer. This also goes for the in-situ probes used in concrete moisture testing under the ASTM F-2170 standard. While the probes can be left in the sealed concrete sleeve, any probes left there for more than a 30-day period will need to have their calibration tested. This is because the probes may have become contaminated and suffered sensor drift which can compromise reading results. If the sensor element is contaminated, it will need to be replaced as soon as possible to restore normal function. If a sensor can get dirty, surely it can be cleaned, right? Well, no—not really. Many things besides dirt particles can cause damage to a delicate RH sensor element—including water, soap, and bleach. Attempting to clean a contaminated sensor element on an RH meter is more likely to cause damage rather than repair it. The best practice would be to replace the thermo-hygrometer. Like with any piece of electronics hardware, putting a digital thermo-hygrometer into extreme cold or extreme heat can cause damage to its internal components—even if there are no outward signs of damage. So, it is generally best to avoid leaving a thermo-hygrometer in extremely hot or cold environments—such as a wood-drying kiln or a walk-in freezer—for extended periods of time. A decent rule of thumb is that if you wouldn’t leave a person in those conditions, you shouldn’t put a thermo-hygrometer in them. If there’s a problem with your thermo-hygrometer not functioning correctly, it is important that you do not try to disassemble the RH meter on your own to diagnose the issue. At the very least, it is possible to expose the delicate internal components of the hygrometer to contaminants that could cause significant damage—not to mention voiding any warranty on it. If you want to get your humidity testing equipment fixed, it’s better to send it in to the manufacturer for them to repair—after checking for basic fixes like replacing the batteries or the sensor element, of course. With Delmhorst’s own repair service, you can request a written cost estimate for repairs—or we’ll send you one automatically if the cost would be high enough that simply buying a new RH meter would be better. 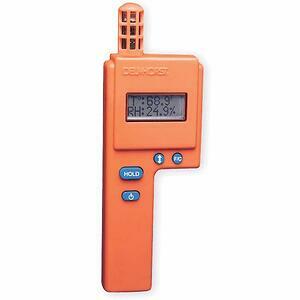 Need more help and advice for thermo-hygrometer care? Or, do you need to find a dealer near you who has the humidity testing gear you need? Reach out to the Delmhorst team today to learn more.